The holiday shopping season for a large swath of retailers is the most important time of the year when they go into the black as a result of generating most of their cash. For the most troubled of retailers, how they perform during the Yuletide season can be serious business, even determining whether or not they can avoid filing for bankruptcy, and how much time they have left to effect a turnaround. This season, apparel retailers in particular may find themselves under more pressure because shoppers have delayed their seasonal purchases for a myriad of reasons, including unusually warm weather. While retailers love to blame the weather for why business is soft, it is applicable in some markets, since it has been so warm this fall and no one was buying, said Peter Schaeffer, a principal at GlassRatner Advisory & Capital. Consumers haven't been shopping for warm clothes this fall, so retailers are "stuffed with goods," he said. Fewer purchases at the start of the season means retailers sell fewer goods at full price and end up with excess inventory that has to be heavily discounted. "Retailers love when it's cold in October. You can make money when it's cold in October. After that you have to mark things down," Schaeffer said, noting that regular priced items usually represent 20% of a retailer's business. That, in turn, leads to lower margins and less profits. "I think it's going to be a tough Christmas. Consumer sentiment toward shopping isn't robust and the Internet has a negative effect on sales" because there isn't incentive shopping and it is a replacement for the shopping done in stores, not an addition, Schaeffer explained. Online shopping also reduces impulse buys, which many retailers have traditionally leaned on to boost sales. In fact, expect to see more restructuring activity after this holiday season than what occurred in a similar period a year prior, said Greg Segall, chairman and CEO of Philadelphia-based private equity investment firm Versa Capital Management. Segall knows his way around distressed retailers. Versa Capital Management's portfolio includes retail banners such as Wet Seal and Avenue, both of which it bought out of bankruptcy protection. Segall said every year there are typically bankruptcy filings after the holidays because the lack of sales takes its toll over time. Yet, retailers are in their best cash position because they have liquidated most of their inventory and haven't paid their vendors yet. Segall is not alone in his assessment. "I think that the first half of next year will be very active, as we are seeing indications that business is soft in the numbers that retailers have been reporting," said Schaeffer. He added there are a number of stores are on the edge of filing, and if they have a bad Christmas they are likely doomed. Raoul Nowitz, managing director at Solic Capital Advisors, said we'll see more retail bankruptcy filings in the coming months. "I don't see it slowing down at all over the next 18 months," he said. "It's been fairly steady, and it might hold to at least last year's clip, potentially a bit more." Meanwhile, mall-based stores continue to face the same challenges this year they have over the past few years, particularly apparel banners. "Mall-based retailers are absolutely affected by the quality of the malls that they are in," Segal said. "It is almost impossible for a retailer to overcome a dead or dying mall and the impact this has on its own revenue, he noted. Similar to the plethora of malls, the U.S. has more square footage of retail space per capita than any other country. "Many modern retailers are struggling with very large stores, or too many stores and not enough purchasing taking place in those stores. The reality here is that, as a result of the Internet competition, there is a clear need to reduce fixed costs," Nowitz explained. "The cost of physical facilities is one of the largest costs in retail. As a consequence it's very hard for the mall-based retailers to compete." Nowitz explained that retailers need to shed leases because of the cost. Some landlords have been willing to adjust leases but it is difficult to do outside of court. "I would expect to see a lot more of that activity in Chapter 11," he concluded. Instead of malls, consumers are gravitating to shopping centers that feature their favorite discounters including TJX's (TJX - Get Report) T.J. Maxx and away from the department stores such as Macy's (M - Get Report) , for example, which as an anchor to traditional malls were historically a big draw. While Macy's, Nordstrom (JWN - Get Report) and Walmart (WMT - Get Report) aren't examples of distressed retailers, they are emblematic of the difficult environment that is going on right now, Segall explained, adding that there have been changes in technology, consumer spending habits and economic insecurity. It's not just that malls have fallen out of favor, or even that more people are shopping online, but that consumers are also gravitating away from clothes to spend their hard-earned dollars on Apple's (AAPL - Get Report) latest iPhone or on food, such as grabbing a burger at the upstart chain Shake Shack (SHAK - Get Report) . People are also spending more on their pets, which in recent years have taken on the role of close family members, and on home improvement with the likes of Home Depot (HD - Get Report) reporting a same-store sales hike of 5.1% for the third quarter ended Nov. 1. And while shoppers spend more on the above categories, that compounds the competitiveness of areas such as apparel. According to numerous industry sources and credit ratings agencies, a top 10 list of some of the more troubled retailers heading into Black Friday this year include Gymboree, J. Crew, Pacific Sunwear of California (PSUN , Claire's Stores, Aeropostale (ARO , Toys "R" Us, J.C. Penney (JCP - Get Report) , Sears Holdings (SHLD , H.H. Gregg (HGG and Bebe Stores (BEBE . In fact, according to Rapid Ratings International, a provider of quantitative analytics related to companies' financial health, all the above companies have a financial health rating of below 40, which means that they all face at least a high risk probability for default over the next 12 months. James Gellert, chairman and CEO of Rapid Ratings International, said his firm's system analyzes over 70 financial ratios, focusing on the interrelationships of revenue, liquidity, cost structure efficiency and profitability among other metrics to arrive at a score, which it calls a Financial Health Rating. Factors such as the introduction of a well-received product, a trend a company has introduced or positive same-stores sales growth, if consistent, are not directly included in the algorithm. But the foundations of these, and how well positioned a company is to capitalize on them, are reflected in a company's myriad ratios and performance categories when analyzed against millions of company years in Rapid Ratings' data. One of the more troubled companies on the list is San Francisco-based children's clothing chain Gymboree. Industry sources say the children's segment is the most competitive it has ever been as discount department stores such as Target (TGT - Get Report) and e-commerce player Zulily (ZU have aggressively made inroads into the space. The amount of competition has also hurt close competitor Children's Place (PLCE - Get Report) , whose stock is trading near its 52-week-low. Gymboree's balance sheet demonstrates why the children's clothing purveyor is in trouble, with only about $20 million in cash, approximately $1.21 billion in debt and $90 million in adjusted Ebitda generated (Ebitda is usually adjusted for items considered to be noncash or nonrecurring) over the last 12 months, all as of Aug. 1, according to data provided by Bloomberg. That's a whopping multiple of debt to Ebitda of about 13.2 times. Because of its precarious financial position, the retailer's 9.125% senior unsecured notes of nearly $350 million due in 2018 are trading at very distressed levels of 32.15 cents on the dollar as of Nov. 13, showing a lack of confidence in the company's future by bond traders. That's bad news for Gymboree's owner, private equity firm Bain Capital, which led a leveraged buyout of the retailer five years ago. Gymboree did not respond to a request for comment. Another struggling apparel retailer, J. Crew has taken a number of large asset impairment charges over the last year as poor results have made the flagship brand less valuable. Although industry sources say that the brand is valuable enough that its PE backers Leonard Green & Partners and TPG may either inject new capital from their own pockets, swap debt for equity or bring in new investors. J.Crew declined to comment. Regardless, some action will likely be required, as the company has only about $40 million in cash and approximately $1.55 billion in debt, while generating "adjusted" Ebitda of about $190 million as of Aug. 1, according to data provided by Bloomberg. That's an unhealthy debt to Ebitda multiple of close to 7.9 times. In the meantime, pay-in-kind (PIK) toggle notes issued by J.Crew's parent holding company Chinos Intermediate Holdings A are also trading at a distressed level of 33.5 cents on the dollar as of Nov. 13. The $500 million of 7.75% senior unsecured PIK toggle notes due 2019 were issued to back a dividend payment to J.Crew's PE owners. Chinos will now make its upcoming May 2, 2016, interest payment by again paying in kind instead of with cash, which will increase the size of the PIK toggle notes by more than $20 million, according to an 8-K filed with the Securities and Exchange Commission on Oct. 30, another poor harbinger. As mall traffic struggles, so do retail chains such as Hoffman Estates, Ill.-based accessories retailer Claire's, which in the past has relied on impulse purchases from the teen demographic. As a result, the accessories chain has been hit hard due to declining mall traffic and a lack of teens browsing their stores, limiting impulse buys. Claire's did not respond to a request for comment. The retailer, backed by PE firm Apollo Global Management (APO - Get Report) , has an unwieldy balance sheet, consisting of approximately $80 million in cash and about $2.5 billion in debt, but only close to $220 million in Ebitda over the last 12 months as of Aug. 1, according to data provided by Bloomberg. That's a debt to Ebitda multiple of 11 times. Claire's $320 million in 7.75% senior unsecured notes due 2020 are also trading at a very distressed level of 31.5 cents on the dollar as of Sept. 24. Sears, despite its continuous presence on numerous death watch lists over the years, has proven the most difficult to fell as it conducts what industry observers describe as a slow liquidation. The battered department store chain sold most of its remaining assets consisting of real estate to a real estate investment trust, or REIT, Seritage Growth Properties (SRG - Get Report) earlier this year, raising $2.7 billion. That cash is buying the Hoffman Estates, Ill.-based company extra time, but likely only delaying the inevitable. Tellingly, about 53.5% of Sears' floating shares are currently shorted. As of Aug. 1, Sears had nearly $1.82 billion in cash, but about $3.14 billion in debt, and it has negative Ebitda of close to $740 million over the last 12 months, according to data provided by Bloomberg. It also has pension obligations of almost $2.26 billion. A Sears spokesman countered the poor assessment, citing credit ratings agency Moody's Investors Service's recent revision in August of the department store operator's outlook to stable, noting the report specifically said "following the conclusion of the REIT transactions and extension of Sears asset-based revolver to 2020 the company has meaningfully improved its liquidity profile." "Sears Holdings is highly focused on restoring profitability to the company and through the second quarter of this year we delivered four consecutive quarters of year-over-year Ebitda improvement," the spokesman said, as it continues to transform itself to a more "member-centric integrated retailer." He added that Sears also reduced its net debt and unfunded pension obligations by the end of the second quarter by about $1.6 billion. Like so many of its competitors in the surf space, Anaheim, Calif.-based Pacific Sunwear is also in danger of a wipe-out. Its stock is trading at a fraction of its 52-week-high of over $3 per share, hovering around 30 cents per share just during the past week. As of Aug. 1, the clothing retailer had more than $10 million in cash, about $100 million in debt, but only approximately $4 million in adjusted Ebitda. More importantly, Pacific Sunwear's same-store sales are also swiftly declining, down 6% for the quarter ended Aug. 1. Also hurting sales is increased competition due to attempts at revivals of brands such as Hang Ten and online retailers such as Swell.com to the likes of sports apparel behemoths Nike (NKE - Get Report) and Under Armour (UA - Get Report) introducing their own surf offerings. The company did not respond to a request for comment. Pacific Sunwear is not the only troubled retailer attempting to appeal to a more youthful demographic. Aeropostale has also seen its stock plummet from its 52-week-high of $4.39 per share, to more recently trade between 60 cents to 70 cents per share. Aeropostale declined to comment. Holly Etlin, a managing director at turnaround advisory firm AlixPartners, noted the market for teen-aged and younger clothing that Aeropostale caters to is particularly challenged. "There's been a shift in consumer behavior in their core customer away from apparel and towards electronics and experiences," said Etlin. There are very few retailers who are doing well in that space. Despite an overhaul of the logo and some of the chain's stores, Aeropostale has been unable to effect the turnaround that its competitor American Eagle Outfitters (AEO - Get Report) has achieved in recent months, although its competition has dwindled as a result of a number of retailers in the category already filing for bankruptcy. As a result, 21.4% of the New York-based teen retailer's floating shares are being shorted. Aeropostale's balance sheet, which consists of nearly $90 million in cash, as of Aug. 1, but about $140 million in debt, won't be of much help. What is particularly alarming is negative "adjusted" Ebitda of close to $70 million over the last 12 months, according to data provided by Bloomberg. Other endangered retailers include electronics retailer H.H. Gregg, based in Indianapolis. Although the company has no debt and roughly $30 million in cash as of Sept. 30, according to data provided by Bloomberg, it has negative Ebitda of nearly $4 million. The company's stock is trading at less than half its 52-week-high of $8.22 per share, sitting at just under $4 per share. And close to 27.3% of the company's floating stock is being sold short. In response, H.H. Gregg's CEO Dennis May emailed, "We remain on track to meet or exceed our three key financial objectives for the year, which are focused on driving improvements for comparable store sales, cost savings and positive Ebitda for the fiscal year." The company is "pleased with the continued traction in our net sales during the second quarter driven by delivering on our fiscal 2016 revenue generation initiatives" and "we have continued our cost-savings efforts and remain on track to meet our plan to save $50 million in fiscal 2016." Wayne, N.J.-based Toys "R" Us, backed by PE firms KKR (KKR - Get Report) and Bain Capital as well as Vornado Realty Trust (VNO - Get Report) , has had its share of troubles and is preparing to abandon some of its flagship stores, including its Times Square location, just as the holiday season approaches. The competition is as strong as ever, as discounters such as Walmart and e-commerce juggernaut Amazon.com (AMZN - Get Report) continue to aggressively target the toy category. Toys "R" Us must contend with the onslaught with only about $420 million in cash, compared with about $5.28 billion in debt and adjusted Ebitda of nearly $680 million over the last 12 months, all as of Aug. 1, according to data provided by Bloomberg. That makes its debt to Ebitda multiple about 7.1 times, below investment grade. Bond traders don't seem overly overjoyed at the company's prospects, as its $450 million in 10.375% senior unsecured notes due 2017 are trading at 80 cents on the dollar, indicating distress. A Toys "R" Us spokeswoman, however, said the company disagreed with the assessment, noting it has hired Dave Brandon, an experienced executive, as its new CEO in July. She said the decision to close the FAO Schwarz and Toys "R" Us stores was because of continuing rent escalations in midtown Manhattan. "These closures provide the opportunity to realize meaningful savings, as the company has incurred annual 4-wall Ebitda losses of approximately $22 million between the two stores," the spokeswoman wrote in an email. The company's trailing 12-month adjusted Ebitda was $724 million as of the end of the second quarter, excluding the cost savings that will be generated by closing the two stores. The spokeswoman also said Toys "R" Us, through the second quarter, had liquidity of about $1 billion, noting, "And, while the company had $5.3 billion in debt, over $500 million is related to its revolving credit facilities which are used to support seasonal working capital needs." "Additionally, over $2.1 billion of debt is at non-recourse property companies. Further to this, we have disclosed that our (trailing 12-month) net leverage has improved by (two times) to 6.7" times as of the end of the second quarter. She blamed "ongoing market volatility" that had an impact on "debt prices across the broad universe of high-yield issuers." Meanwhile, Brisbane, Calif.-based women's clothing chain Bebe is also troubled despite no debt, as same-store sales for its first quarter ended Oct. 3 declined 4.1%. The mall-based clothing chain needed better news, considering that it has only $50 million in cash, roughly, and negative adjusted Ebitda nearing $10 million over the last 12 months, according to data provided by Bloomberg. Investors are not entirely confident in what some industry observers characterize as a third attempt at a turnaround, with 22% of the company's floating stock shorted. Bebe did not respond to a request for comment. Perhaps the least endangered is Plano, Texas-based J.C. Penney. The department store retailer is doing better relative to its terrible performance in recent years, damage that was largely inflicted on the watch of former CEO Ron Johnson. But the enormous amount of debt the company took on to fund its turnaround puts it in a precarious position. J.C. Penney did not respond to a request for comment. As of Oct. 31, J.C. Penney had almost $640 million in cash, and even generated adjusted Ebitda of about $620 million over the last 12 months, but carried nearly $5.28 billion in debt, according to data provided by Bloomberg. That's a debt to Ebitda multiple of almost 7.5 times. So while the company's performance is improving, it remains vulnerable to both a recession, or on the other hand, to a significant rise in interest rates. The retailer's $400 million in 5.65% senior unsecured notes due 2020 indicate slight distress as they trade at 86.75 cents on the dollar. But it should be noted that bond traders have more confidence in the $220 million in 7.95% senior unsecured notes due 2017, as they trade at 102 cents on the dollar. Yet, investors are not so keen on the stock, as about 31.8% of the company's floating shares are shorted. "To keep its momentum, JCP's going to need to show a great holiday season. This market is finicky and JCP's recent stronger stock performance can turn on a dime if they don't show promising holiday sales," said Gellert. In fact, a strong holiday season would help J.C. Penney go into 2016 with a reasonably strong valuation, which would help if it needed more capital. Schaeffer said J.C. Penney is likely to be viable for the time being, but has the potential to file for bankruptcy in the future, as it has not conquered all of its problems. 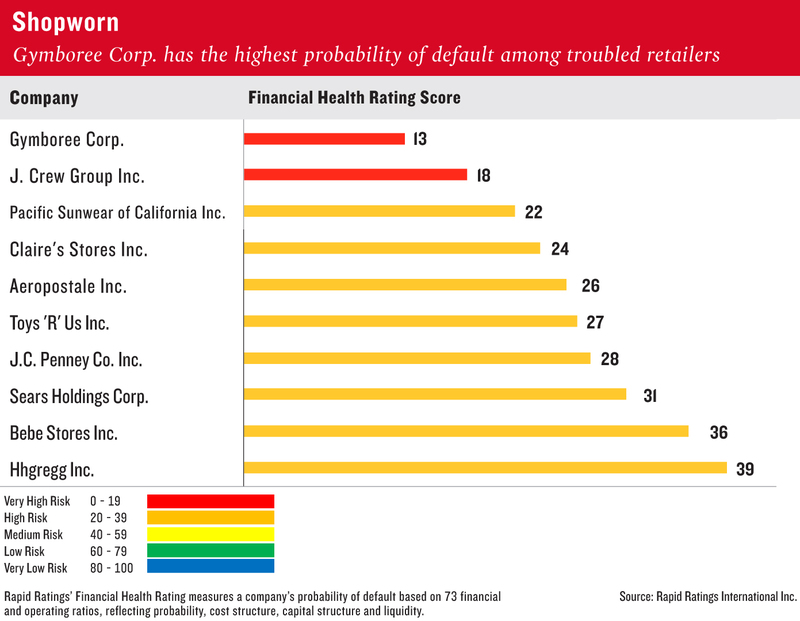 Retail, despite a stable economy in recent years, has seen a fairly steady flow of bankruptcy filings, so seeing any of the above banners succumb, particularly Gymboree or Claire's, would not be surprising. Jay Indyke, a partner and Cooley's chair of its corporate restructuring and bankruptcy practice, said that which companies end up filing for bankruptcy may depend on how aggressive its lenders are and what kind of mistakes the company makes. Indyke said mid-sized retailers are struggling the most. He cited several bankruptcy filings this year among middle market retailers, including Cache, which filed for Chapter 11 on Feb. 4, and C. Wonder, which filed for bankruptcy protection in New Jersey on Jan. 22. USA Discounters also filed for bankruptcy protection on Aug. 24. "There is a great effort to work things out, outside of court, but it depends on what the ownership and lenders are looking to get out of the company and what their tolerance is. There are some companies where the owners aren't willing to put in any new money and the lenders aren't willing to extend their debt," he said. "I am not sure that I am seeing something right now that will change what has been happening," Indyke said, adding the consumer is buying and there is greater employment so people have more disposable income than they did a few years ago, but not so much as to spend it both via e-commerce and in brick and mortar stores. The year has already seen a number of retailers go belly up. Los Angeles-based retailer American Apparel and private equity-backed City Sports filed for Chapter 11 on Oct. 5, only a few weeks after surfwear retailer Quiksilver filed for bankruptcy protection. In addition, consumer electronics retailer RadioShack filed for Chapter 11 on Feb. 5 and sold a large portion of its assets to an affiliate of hedge fund Standard General. Wet Seal and Frederick's of Hollywood also went through bankruptcy, while Body Central liquidated through an assignment for the benefit of creditors on Jan. 9. For retailers that file for bankruptcy, beware. AlixPartners' Etlin believes one of the most significant trends in retail restructuring is the high rate of liquidation in bankruptcy. She attributed that tendency partly to changes in 2005 to the U.S. bankruptcy code that sped up the restructuring timeline in a way that favors landlords over their tenants. In October, AlixPartners published a survey of resolved bankruptcies spanning the beginning of 2006 to June 30 among companies with more than $50 million in liabilities, and discovered that 55% of those filings ended in liquidation. In other industries, as few as one in 20 bankrupt companies may liquidate, the report noted.